OMAHA, Neb. – Game 1 of the College World Series Finals between SEC rivals LSU and Florida at TD Ameritrade Park Omaha, is Monday night and you can stream live coverage on ESPN3 and WatchESPN, starting at 7 p.m. ET. The third-seeded Tigers (52-18) fended off elimination twice to upset No. 1 Oregon State and punched their ticket to the College World Series finals, while the fourth-seeded Gators (50-19) beat No. 6 TCU to secure their spot. After losing 13-1 to the Beavers in their second game of the CWS, LSU needed to win three straight games to advance to the championship game and coach Paul Mainieri side did just that to eliminate the favourites from the NCAA Tournament on Saturday. The Tigers, who won the 2017 SEC title, are seeking to win their seventh national championship. “We’re thrilled to be in the Finals here,” Mainieri said, looking ahead to the clash with Florida. “I just think it’s an awesome thing that these two SEC schools get to play for a national championship. “This is a great thing for us to play each other here in Omaha, and I know both teams are going to play their hearts out. Florida, in the meantime, beat TCU in its winner-takes-all clash at the weekend to start its quest for a their first College World Series national title. The Gators were flogged 9-2 by the Horned Frogs in Game 1 of their Final Four clash on Friday but bounced back on Saturday to win Game 2 by a scored of 3-0. 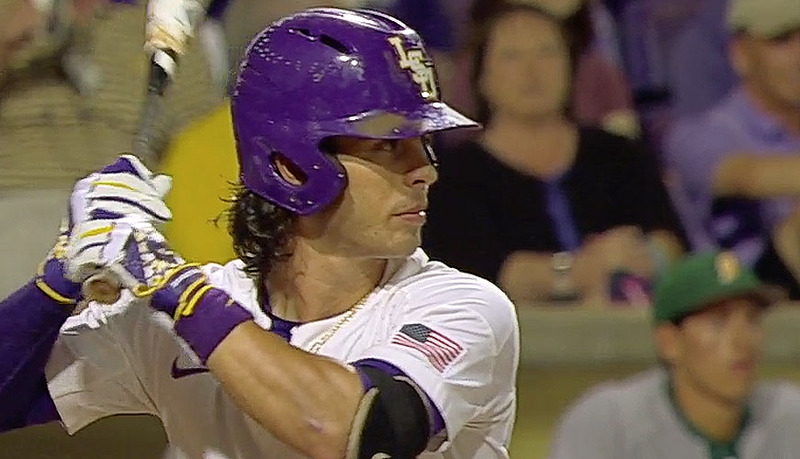 LSU went 1-2 in the regular season series in March, but comes into Monday night’s Game 1 with a 4-0 all-time record against Florida in College World Series games. “They are great competitors and so are we,” Gators junior pitcher Alex Faedo said. The Tigers defeated the Gators in two straight games in Omaha in both 1991 and 1996 on their way to winning the national championships. In the meantime, Mainieri confirmed that senior right-hander Russell Reynolds (1-1, 8.59 ERA, 14.2 IP, 11 BB, 12 SO), who pitched a scoreless inning in last Monday night’s defeat against Oregon State, will start on the mound for the Tigers in Game 1. Sophomore right-hander Brady Singer (8-5, 3.18 ERA, 119.0 IP, 30 BB, 117 SO) will be the starter for the Gators.